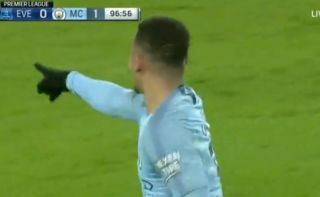 Manchester City striker Gabriel Jesus scored to make it 2-0 to the reigning champions against Everton tonight, sending the team back to the top of the Premier League table. Liverpool are now second on goal difference, though they have a game in hand on their title rivals, so can restore their three-point lead if they get back to winning ways after a recent slump. This was far from the kind of beautiful football we’re used to seeing from Pep Guardiola’s side, with Jesus getting a lot of luck before his header eventually looped in to end tonight’s contest at Goodison Park.